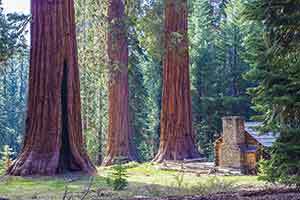 Nelder Grove is in Sierra National Forest just six miles south of Mariposa Grove. 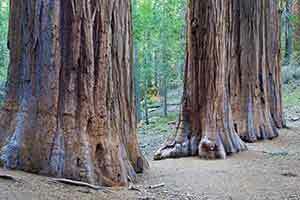 Although the grove covers a large area, its sequoias are very widely scattered. 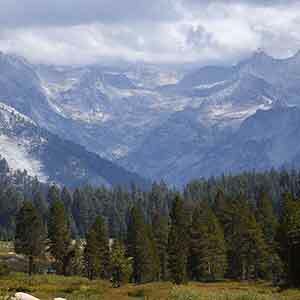 On the trail to Old Grandad, for example, there’s a lone sequoia every half-mile or so. At one time the grove had a core — the area around the campground, including the Chimney Tree and Bull Buck Trails — where the sequoias, though still few in number, were somewhat more concentrated. Unfortunately this is the one part of the grove that’s been logged. 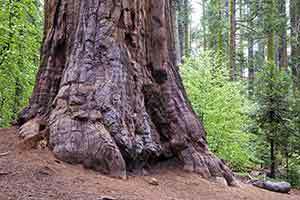 Judging from the size of the stumps, the core area must have been quite scenic at one time, though not as nice as the Mariposa Grove. 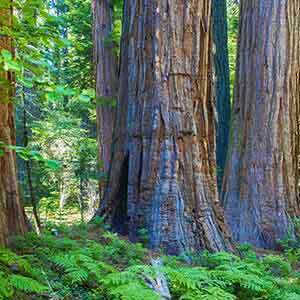 Several other sequoia groves, such as Evans and Lockwood in Sequoia National Forest, also have a small central core with a relatively high density of sequoias surrounded by a much larger area with a very low density of sequoias. 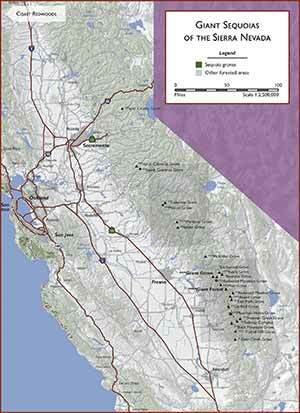 In these cases, though, at least part of the central core has survived. As if to make up for the scarcity of sequoias, the rest of the forest in Nelder Grove is unusually attractive. Lush and dense, with pleasantly green groundcover and abundant dogwood understory, it’s one of the more attractive Sierra forests that I’ve seen. 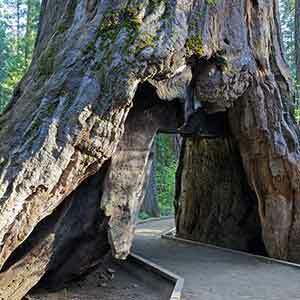 The most striking tree in the grove is the Bull Buck Tree, the lone surviving member of a row of three sequoias. The tree is known for its flared base, which gives it an unusually high diameter, but the rest of the tree is pretty impressive, too. It has an attractive pinkish hue that compliments the surrounding greenery. 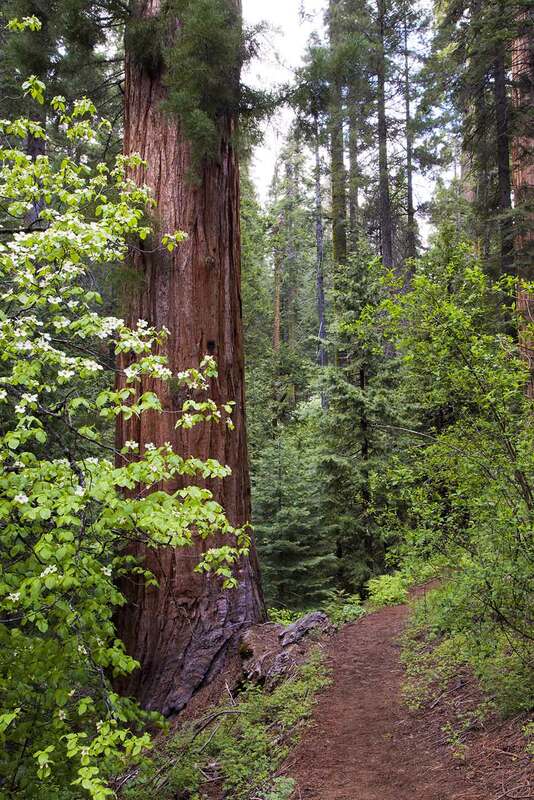 The tree is the only remaining sequoia on the Bull Buck loop trail. The Chimney Tree Trail is the most popular of grove’s trails. It leads through the most heavily-logged portion of the grove. 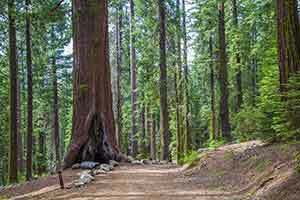 Only a few large sequoias remain on this trail. 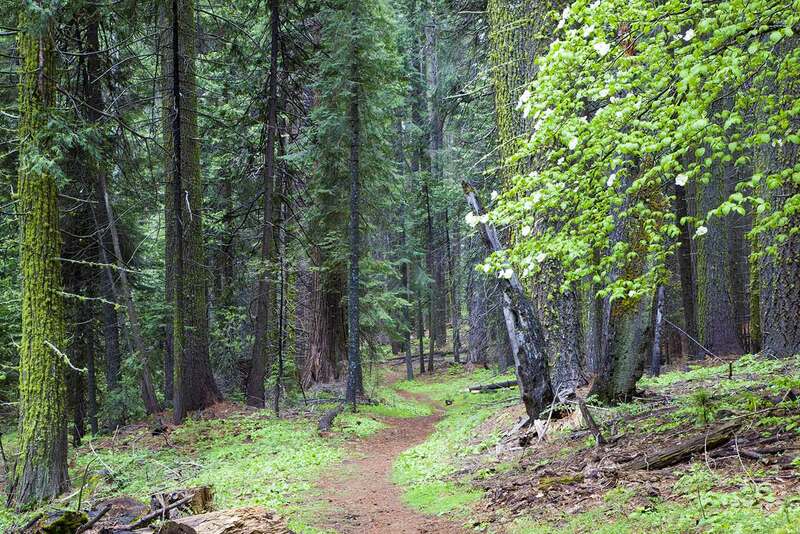 The trail to Old Grandad is an old dirt road that gradually climbs for three miles. Along the way an occasional lone sequoia appears; each one is more impressive than the last, culminating in the huge Hawksworth Tree, which is the highlight of the hike. Old Grandad itself is just behind the Hawksworth Tree. It’s almost completely hidden by understory trees, but the top of the tree has some huge and rather odd-looking asymmetric branches sticking out. Nelder Grove’s campground is quite nice. It’s much smaller and much less crowded than the national park campgrounds, and as already mentioned it’s surrounded by attractive woodland. It’s odd to see people collecting and chopping wood for fires from the forest right next to the campground, but since this is a national forest they’re a lot less strict than the national parks. 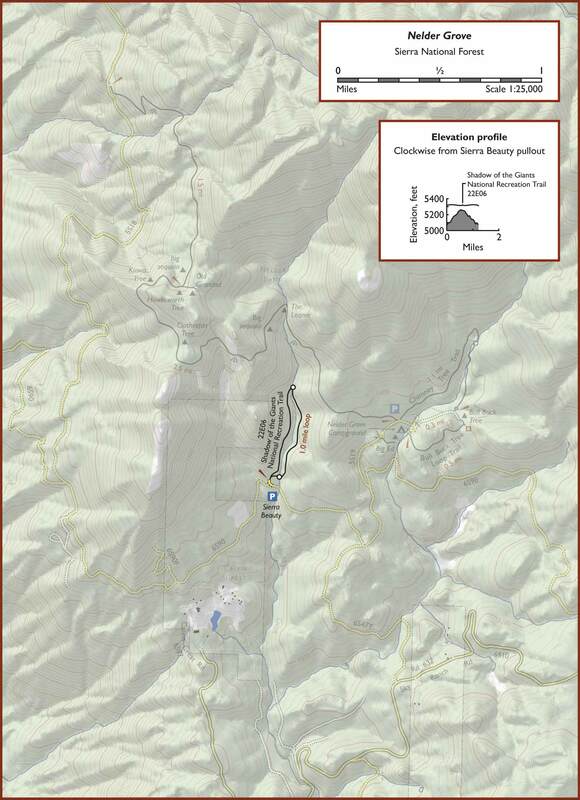 The grove is reached by a winding 7-mile climb on a wide paved road, followed by 2 miles on dirt roads that are initially well-graded but get increasingly rough as you approach the grove. For the Shadow of the Giants trail it’s easiest to park in the Sierra Beauty picnic area just across the road rather than try to climb the short rutted drive to the actual trailhead. The Shadow of the Giants Trail is the grove’s best trail. None of its trees are as impressive as the Hawksworth or Bull Buck Trees, but the trail is much shorter than the hike to the former attraction and is in a much more pristine environment than the latter. 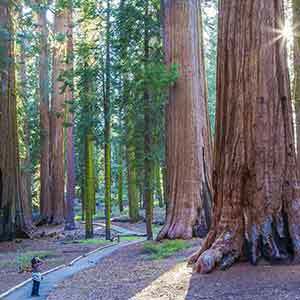 Typically for Nelder Grove, the one-mile trail has few sequoias: only four good-sized trees, all on the west side at about the halfway point, plus a few more small sequoias on the east side of the creek. 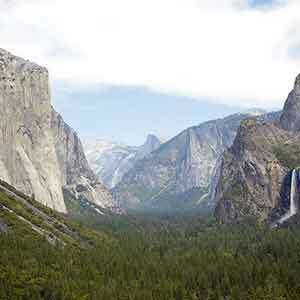 Also typically for this area, the woods around the sequoias are very attractive. Interpretive signs along the trail discuss different kinds of trees from a logging viewpoint, describing what products that can be made from their wood.